Sober Look: Foreclosures making their way through the "python"
Foreclosures making their way through the "python"
The latest RealtyTrac data is continuing to show a decline in home foreclosures. However in November we saw an uptick in court-ordered auctions - a stage prior to repossession. It sounds scary when one puts it this way: "another surge of bank repossessions". Yes, the banks are coming to take your home. But this increase in court-ordered auctions has actually been expected, as the foreclosure moratoriums are coming to an end. Chicago Tribune: An increase in auctions had been expected. Foreclosure moratoriums that took hold a year ago in the wake of investigations of mortgage servicers' practices were lifted earlier this year, and mortgage companies and court systems began pushing through foreclosure cases that had been piling up. Servicers continued to send out default notices during the investigations. 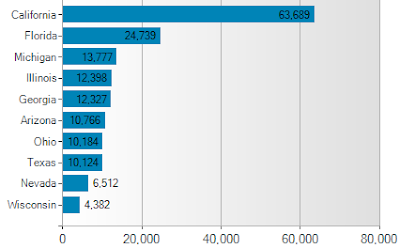 In particular the end of the California moratorium on foreclosures (the California Foreclosure Prevention Act of 2009), which ended at the beginning of 2011 is impacting these numbers. In the charts below, California dominates the current foreclosure results. 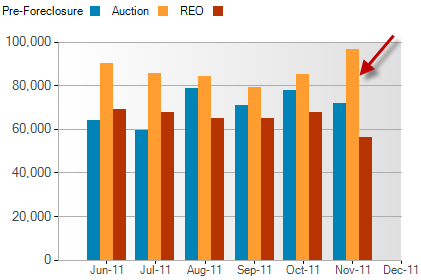 Going forward the California REO number will continue to stay large due to the backlog of court-ordered auctions. There is little unexpected behind these numbers. The "surge of bank repossessions" is just the full process which had been slowed by the courts and foreclosure moratoriums and is making it's way through the system. It's a bit like "a pig making it's way through the python" as some have described it. And substantial improvements in the overall real estate market are unlikely to occur until we are closer to the end of the "python".